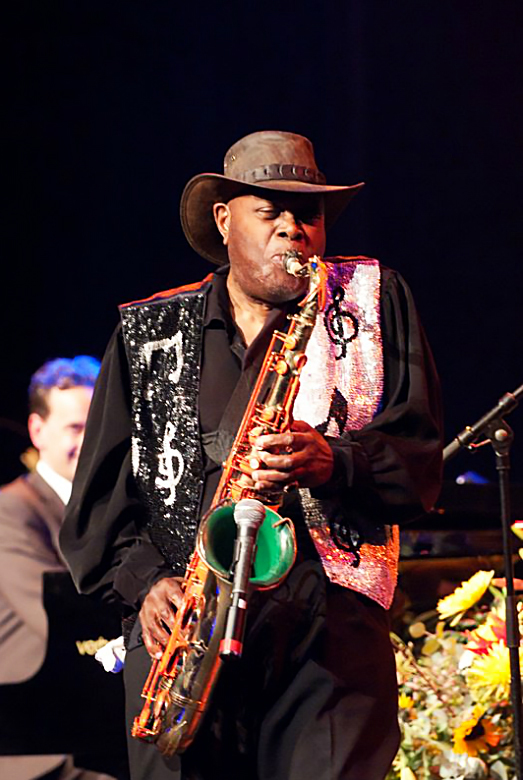 As one of the titans who made tenor sax the solo instrument of choice during rock’s primordial era in the late 1940s, Big Jay McNeely could peel the paper right off the walls with his sheets of squealing, honking horn riffs. “The king of the honkers” has been wailing hard for over seven decades, and he’s still going strong. Born in Watts, California, on April 29, 1927, McNeely formed his own band with jazz legends Sonny Criss (alto sax) and Hampton Hawes (piano) while still in high school. He joined the musicians union in 1944, which at that time in Los Angeles was segregated. (His membership in the black Local 767 transferred to Local 47 when the two unions amalgamated in 1953, and he now holds a Life Membership card.) In late 1948, when he was asked to record for Savoy Records, he abandoned jazz for something more raucous and struck paydirt when his second release, a honked-up instrumental called “Deacon’s Hop,” went to No. 1 on the national R&B charts in February 1949. For the next several years, Big Jay, according to the New Rolling Stone Encyclopedia of Rock & Roll, “was famed for his playing-on-his-back acrobatics and his raw, hard-swinging playing.” During his act he’d leave the stage, walk across the top of the bar, and sometimes walk out the door of the club, often with a line of people following him. Once, in San Diego, during one such “walk,” he was arrested on the street for disturbing the peace; inside the club, his band kept playing until someone could rush down to the police station, post Big Jay’s bail, and bring him back to finish his song. In the 1950s Big Jay added vocal groups to his act, beginning with Four Dots & Dash, which included, at one time or another, 16-year-old Jesse Belvin, Marvin Phillips (later of Marvin & Johnny fame), Tony Allen and Mel Williams. In fact, Belvin made his first recordings with Big Jay, including “All That Wine Is Gone.” Big Jay also worked extensively with The Hollywood Flames, The Penguins and The Medallions up and down the West Coast. In 1955-56 he shared the stage with the Clovers, the Harptones (at the Apollo Theater), Bill Haley and His Comets, the Moonglows, Little Richard, and others. In 1959 Big Jay enjoyed his biggest hit, a blues ballad called “There Is Something on Your Mind,” featuring Haywood “Little Sonny” Warner on vocals. The record stayed on the R&B charts for six months and reached as high as 44 pop. The song was later a hit for Bobby Marchan. Other artists who have recorded Big Jay’s song include B.B. King, Etta James, Freddy Fender, The Hollywood Flames, Gene Vincent, Albert King and Professor Longhair. Big Jay had been retired from full-time music for 20 years, but in 1983 he returned to performing and hasn’t looked back. He is still tearing it up at venues around the world and knows how to delight and entertain an audience of any size, from small clubs to stadium crowds. He speaks here with Linda A. Rapka about his incredible musical career. You became known as “the king of the honkers” as much for your skill on your instrument as for your flamboyant stage presence. You also have a pretty unique looking horn on stage. In May 2014 you were inducted into the Blues Hall of Fame in Memphis. Your songs have been covered by the likes of B.B. King, Etta James, Albert King, and Gene Vincent. Do you have a favorite cover? That’s quite a departure from your jazz roots. The interview portion of this piece was originally published in the July 2014 issue of Overture. This entry was posted in Features and tagged Big Jay McNeely, musician interview on February 7, 2017 by admin.